Actually, both wanted to return to the highest mountain on earth next fall. But the Chinese put a spoke in their wheels. 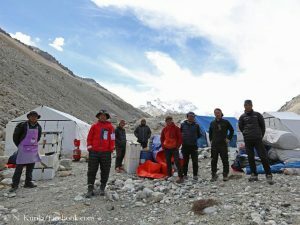 The authorities in Tibet will not issue any permits for Mount Everest in fall 2017. For this reason, the Japanese Nobukazu Kuriki as well as the Spaniard Kilian Jornet join the crowd of those who want to climb Everest from the Tibetan north side this spring. The 34-year-old Kuriki has already arrived in Chinese Base Camp at 5,200 meters. Kuriki has announced that he wants to climb up to 7,500 meters on the normal route. Subsequently, he wants to try again to climb through the North Face, solo and without bottled oxygen.